Today we review Synchro Gold Tumeric Elixir. 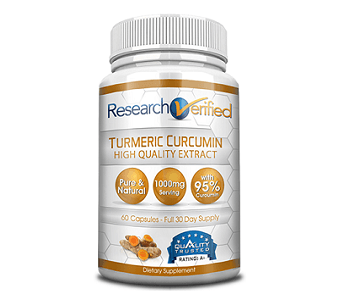 Turmeric is related to ginger and commonly used as a seasoning and natural food colorant. However, numerous studies seem to indicate that its benefits go beyond these everyday applications. Synchro Gold Tumeric Elixir claims to reduce inflammation, thereby easing joint pain, increasing energy, strengthening the immune system and even improving brain function. Learn more about this product from our review below. This appears to be a good ingredient list, with no artificial colorants or flavorings. However, it does not provide the recommended percentage of curcuminoids. A level of 95% is thought to be necessary for optimal benefits. Synchro Gold lists a serving size as one liquid ounce and suggests taking one to two doses daily. Research seems to indicate that the best dose is 1000mg, so a single daily serving would likely be ineffectual. The manufacturer lists no side effects but does recommend consumers on blood thinners consult their physicians. Those with allergies should be aware that Synchro Gold sometimes manufactures products containing tree nuts. Some reviewers have experienced heartburn while taking this product. Many consumers found the flavor nearly intolerable. 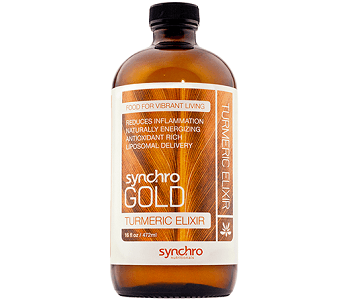 Synchro Gold sells its Turmeric Elixir through its website at a cost of $28.97 for a 16oz bottle. Subscribers receive a 10% discount. Shipping and handling rates are $6.50 for one bottle. Given that an effective dose is two ounces, consumers are paying $3.60 per serving excluding shipping. This seems quite costly. Synchro Gold offers no guarantee for its Turmeric Elixir and offers refunds for unopened products only. Given the cost of this supplement, reviewers complained of the lack of guarantee. We share their disappointment and feel that a company confident in its product will offer a strong guarantee, allowing the customer to try the product without risk. Synchro Gold is the only online source for its Turmeric Elixir. The website has a customer review section and, to its credit, the manufacturer has posted some negative reviews. However, there is no way to tell how many were received. There are some things to like about Synchro Gold Turmeric Elixir. It has a simple ingredient list and is suitable for vegetarians and vegans. It utilizes organic ingredients and is produced in a cGMP certified facility. Unfortunately, we have concerns as well. While the ingredient list is admirable, there is no indication of the level of curcuminoids. The recommended dosage may be too small for efficacy, leading customers to waste money on an unhelpful product. Some users have experienced stomach distress and many complained of the taste. The price of Synchro Gold Turmeric Elixir seems somewhat high compared to similar products. Finally, there is no guarantee at all, which causes us to question the efficacy of the product. After careful review, we cannot recommend this product.